Vilniaus Statybos Senjorai took out first place in the Cup for the M65 age group against the powerful CSKA Veterans 49:36. Lithuania’s Edmundas Narmontas was efficient with his 17 points and 7 rebounds while Eduardas Kairys added 10 points for the victory. Evgeny Abramov was the only one in double figures for CSKA with 12 points, also collecting 5 boards. Third place in the M45 age category was taken by Project 44 defeating Parnu 54:43. Georgy Martishkin led the way with 20 points and 7 rebounds for the Russians with Alexander Ustinov adding 10 points. 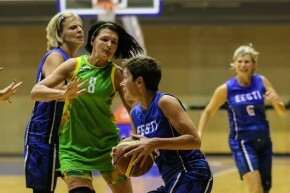 Mait Kabin picked up 10 points for the Estonians in the loss. Patvanka were too good, taking 1st place in the M50 age category in the Baltic Cup with scoring machine Arvydas Venclovas potting 28 points for the winners. Ramunas Juska came to the party with 14 points and 12 rebounds while Gintautas Liutackas added his share with 14 points for the Lithuanians. Arsenal-Tula’s Andrian Morozov provided 14 points, but it wasn’t the Russians’ game today. Fairly comfortable 1st place winners in the M60 age category, Zalgiris-KTU defeated Simuna IVAX by 30 points 73:43. Vitoldas Masalskis hit 22 points for the Lithuanians, ably assisted by Virginijus Mazonas with 21. Valeri Pavlov was the only one with double figures for the Estonians with 15 points in the one-sided contest. Jurmala/Lapmezciems had no answers against Pakruojo Parketas in the M45 age category giving up first place in the Cup to the Lithuanians, 66:57. Arunas Seferis’ 25 points and 5 rebounds and Gintaras Staniulis’ 8 points and 11 rebounds ensured victory for the winners. Lauris Jakobsons had 22 points and 7 rebounds for the Latvians, but it wasn’t enough to tip the scales. In the only game in in the grand masters M70 age group, LBSK took out the title easily, 61:16 against Neptuieciai/Statyba. Three players, Viktors Malzubs, Edgars Miglinieks and Karlis Strelis hit 11 points, and Egils Pans had 10 points and 8 rebounds for the Latvian team. Rimas Vaisnoras picked up 9 points and 5 rebounds for the losing Lithuanian team. For 1st place in the M40 age group, Alkajas-Dastra beat KK Ribi, 70:61. Virginijus Sirvydas was in top form with 27 points and 6 rebounds, with Egidijus Mikalajunas adding 22 points for the winning Lithuanian team. Priit Lokushievski had 20 points and 8 rebounds for the Estonians, while Indrek Leppik contributed 15 points. At the end of the day, Kekava just had too much in the tank, taking out 1st place against Sailita in the M55 age category. Igors Lukis had 16 points and 6 rebounds for the winners, with Gundars Sprogis adding 12. For the losing Lithuanian team, Steponas Jokubauskas had 18 points and Arunas Sarka had 17 points.